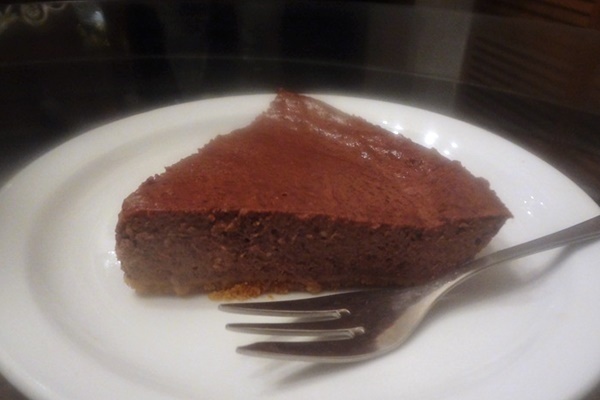 This luxurious chocolate yogurt cheesecake is a “dessert” recipe entry in the So Delicious Dairy Free 3-Course Recipe Contest, submitted by reader Hidemi Walsh. For this dairy-free delight, Hidemi uses the richness and tang of Greek-Style Cultured Almond Milk from So Delicious. 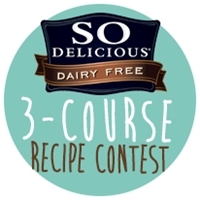 This recipe is dairy-free / non-dairy, peanut-free, soy-free, and vegetarian. Most unsweetened baker’s chocolate is dairy-free, but if severe milk allergies are a concern for you, make sure that their aren’t any cross-contamination issues to contend with. Also, we haven’t tested this recipe egg-free as of yet. If you confuse eggs with dairy, you are not alone. See this post: Are Eggs Dairy? For gluten-free and dairy-free yogurt cheesecake, simply swap the ordinary grahams with Kinnikinnick S’moreable Grahams (love these!) 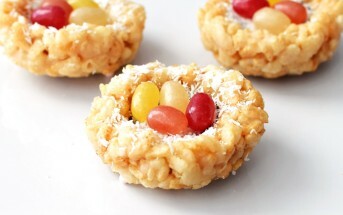 or a crunchy gluten-free cookie, such as Enjoy Life Honey Vanilla Graham Cookies. 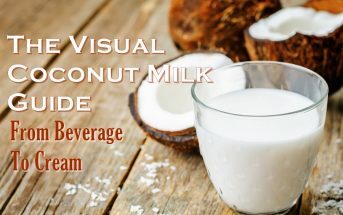 For tree nut-free and dairy-free yogurt cheesecake, So Delicious Dairy Free also offers Greek-style Cultured Coconut Milk and Coconut Milk Beverage. Recipe and photo by Hidemi Walsh, submitted for the So Delicious 3-Course Recipe Contest. See the post above for special diet options. Mix together graham crackers and olive oil in a bowl. Transfer to a greased 9-inch pie pan, and press mixture firmly on the bottom of the pan. Chop chocolate and put into a saucepan. Stir in half of almond milk. Heat over medium heat and melt chocolate completely, while stirring constantly. In another bowl, mix together yogurt, granulated sugar, beaten eggs, all-purpose flour and cocoa powder. Stir in the rest of almond milk and melted chocolate. Pour the mixture on the crust and bake for 45 to 50 minutes. Let cool at room temperature for 20 to 30 minutes. Then refrigerate for 2 to 3 hours to set up.